For years, surveys have indicated that members of the youngest generation of adults in the U.S. are far less likely than older Americans to identify with a religious group. But a major new Pew Research Center survey finds that, as time goes on, the already-large share of religiously unaffiliated Millennial adults is increasing significantly. A high percentage of younger members of the Millennial generation – those who have entered adulthood in just the last several years – are religious “nones” (saying they are atheists or agnostics, or that their religion is “nothing in particular”). At the same time, an increasing share of older Millennials also identify as “nones,” with more members of that group rejecting religious labels in recent years. Overall, 35% of adult Millennials (Americans born between 1981 and 1996) are religiously unaffiliated. Far more Millennials say they have no religious affiliation compared with those who identify as evangelical Protestants (21%), Catholics (16%) or mainline Protestants (11%). Although older generations also have grown somewhat more religiously unaffiliated in recent years, Millennials remain far more likely to identify as religious “nones.” The 35% of Millennials who do not identify with a religion is double the share of unaffiliated Baby Boomers (17%) and more than three times the share of members of the Silent generation (11%). Fully 36% of the youngest members of the Millennial generation – those between the ages of 18 and 24 when the survey was conducted in 2014 – eschew an affiliation with organized religion. This youngest group was not eligible to be surveyed as adults during Pew Research’s initial Religious Landscape Study in 2007. But the older cohort of Millennials – those born between 1981 and 1989 – was surveyed that year, when they were ages 18-26. In 2007, 25% of this group identified as religious “nones.” Among this same cohort, now ages 25-33, the share of “nones” has increased 9 percentage points and now stands at 34%. It is possible that more Millennials who were raised unaffiliated will begin to identify with a religion as they get older, get married and have children, but previous Pew Research Center studies suggest that generational cohorts typically do not become more religiously affiliated as they get older. 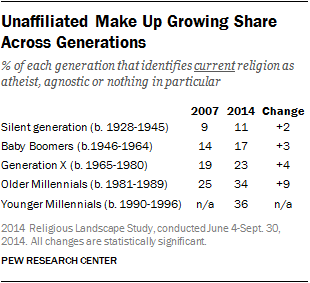 And the new survey finds that most generational cohorts actually are becoming less religiously affiliated as they age.